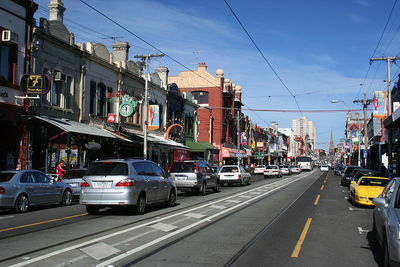 For me, Brunswick Street truly reflects the nature of Melbourne as a city. Melbourne can pride itself on being culturally diverse, and that's exactly what Brunswick street achieves. Something about this gem of Fitzroy suggests a more artistic, culturally sophisticated atmosphere. Head to the Brunswick Street Gallery or the Charles Street Artists Market for some artistic inspiration. The cafes are quaint but quirky! Enjoy a cherry ripe latte or home made hot chocolate with a slice of banana bread or carrot cake. Most of the cafes have picked up a charming 50s retro style interior, making for a very relaxing spot to catch up with friends. Some WeekendNotes favourites include Red Tongue Cafe and Babka Bakery Cafe. The bars in Brunswick Street are hard to beat! With a different bar every hundred meters it truly is the best place to go for a great night out. Bar Open is a particular favourite as it attracts all kinds of crowds, from business men to studio artists. For a reasonably priced drink and great company, catch the 86 tram from the CBD into Brunswick street in minutes. Brunswick Street is also home to fantastic organic vegetable stalls, book shops, clothing stores and art studios. No matter what you're into, no matter what you're looking for - You're bound to find it on Brunswick street. sidewalks are too small, but i guess thats unique for it.